As a bride (what a strange term I would have never imagined using on myself), I understand the pain of wanting everything to be perfect within sanity. With a million and one things to budget for, spending a good $500 dollars or more on something that guests might not necessarily appreciate is possibly the last thing you'd want to be splurging on - AKA wedding invitations. I initially thought of going the fine art wedding invitation route; the fanciest hand lettered stuff dreams are made of. When I started becoming more involved in the planning process, I dropped the idea. Gaining more practical sensibilities, I thought OK we could purchase a design online, and just get them printed at a shop. Little did I know that wasn't easily achievable or exactly cheap either. With 4 different invitation designs to get printed, each in various small quantities of tens, most printing shops charged for a minimum quantity of 100. Scouring for print shops on the internet, in Singapore and Hong Kong - a place which I thought would provide me a luxury of affordable options - , I was disappointed to find out that the quotes were still above what I'd like to pay for. Fine art wedding invitations were an absolute no-go given the high cost, and wedding invitation shops in Singapore and Hong Kong felt like quite a rip-off for the small quantity I required. Then it hit me. I'd remembered printable invitations seen on Etsy but always assumed they'd turn out pretty unprofessional and possibly ugly. Plus all the work printing and cutting. Scrolling through Etsy though, I didn't find a design that I particularly liked; most designs were either very 'preppy' or didn't match the vibe of our wedding theme and style. So I did it myself. I designed my own wedding invitations. Rustic yet elegant invitations designed by me at Annadria Studios. Truthfully, making your own wedding invitations make the wedding preparation process that more special. It isn't actually as much work as I had imagined. Particularly if you're someone who enjoys DIY-ing things, you'll find it actually satisfying. 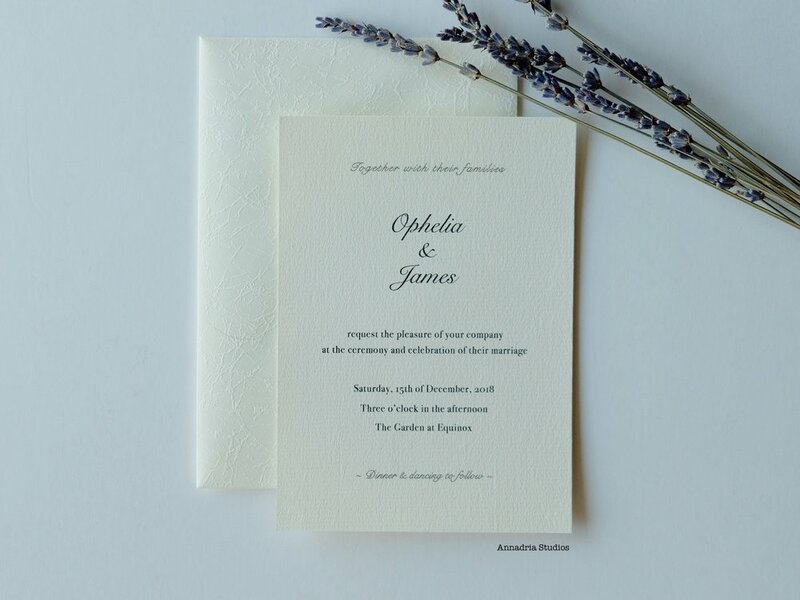 I personally loved every bit of the design process, from picking the fonts to choosing the exact type of textured paper to print the invites on. Invitations with guest names, designed by Annadria Studios. Still considering whether to DIY your wedding invitations? The thing is, if you're a hands-on kind of bride/groom, why not? You get creative control. Designing it yourself or having it custom designed to your liking means it's unique and you can be sure no one else would have the same wedding invitation card design as you! You also get to personalise it to every detail and have it in a style congruent to your wedding theme. 1. Design your invitation... or get them custom designed if you're not so savvy with design. You can find plenty of invitation card designers including myself on platforms like Etsy. 2. Once you've picked up your invite design and gotten all the details sorted out, you'll need to get it printed either at home or at a print shop near you. A print shop will obviously cost you more, but may be the way to go if you have plenty of invitations to print. To give you an idea, I managed to print about 130 invitation cards on my own quite easily using our home inkjet Canon Pixma iP8770 printer (similar to the Canon iP8720). All the printed samples you see above as well as on my Etsy shop are printed using this same printer. In terms of paper cardstock for my invitations, I used a mixture of linen paper and laid paper that I found at a nearby bookstore. The textured cardstock gave it the rustic look I was aiming for with my invitations. For reference, the cardstock used was 200 - 220gsm as that was as much as my printer could take on, as are the samples on my Etsy shop. If you're doing the printing on your own, do check what maximum weight cardstock your printer can manage. 1. Consider the font style and size. Is it legible? There are plenty of beautiful calligraphic style fonts that you may like to use, but are often not very feasible for use. You may want to consider whether older folks will need to squint if the words are minute, and whether the average person is able to decipher the words printed on your invite if you're choosing fancy fonts. Sometimes, after looking at a design for an extended period of time, it's hard for you to judge; so show a printed sample to a family member and ask them for feedback. 3. Etiquette. Whose names will be on the card? While in this modern age, most couples host the wedding and usually have just their names on the wedding invite, some couples/ families may require or choose to have the bride/groom's parents' names on the invite as well. This may be something to consider especially for the ethnically Chinese couples. To give you an idea, when designing our wedding invite, I ended up designing separate parental invites. One set with just our bride & groom names as hosts - given out to our own friends -, and another set including our parents' names as hosts - for them to send out to their friends and family. (This may sound strange to you if you're not ethnically Chinese. But to explain it briefly, it is tradition to have invites which include both the bride and groom's parents' names, because parents of the bride and groom will invite their own friends and family to their children's wedding. This is also practised in some other Asian cultures.) Of course, this is totally dependent on how traditional or particular you/your partner or your folks are. 4. Size of the invitation card. How big or small do you want the invitation to be? The standard invitation card size is around 5 x 7 inches, while my own invitations and the ones I featured above are about 4 x 6 inches as I wanted something a little handier. If you have lots of details, or the font you use is rather large, you may want to opt for a bigger size. From my experience, looking for cardstock in a particular size plus weight & texture may not be easy, so be prepared to compromise on some aspects if you're going for something special. Fancy the invitation designs featured in my post? Do check out my Etsy store, Annadria Studios! I design invitation designs at affordable prices, and I work with you from start to finish in the design process to ensure you are happy with your invite. I personalise all desired text for you so all you need to do is get them printed on your own home printer, or at your local print shop! I also do custom design work if you'd like something one-of-a-kind. Contact me at studios@annadria.com for any requests or questions. If you’re looking around for beautiful jewellery and accessories, I highly encourage you to spend a minute or two browsing my artisan jewellery store Annadria Luxe Bijouterie. You’ll find everything from classic bridal pieces to unique gifts for your bridal parties! I do custom made and bespoke pieces as well, for brides wanting something extra special.